Recently, I returned from a road trip with my wife, brother and our dogs to visit my parents for the holidays. We took our new 2014 Chevy Volt. From the heart of Colorado in Denver to Trinidad on the southern border of the state, the Volt performed amazingly. The trip, and our travels around town, comprised just shy of five hundred miles. The average mileage on the trip came out to be right around 39.4MPG. I was impressed, to be sure. But the impressive part? How well the Volt handled inclement weather. I am by no means a car guy, I mean, I wrench on my own vehicles and help buddies when it's not a serious issue. I've replaced starters, exhaust systems and various other parts, but I'm no mechanic. I'm an enthusiast. I have been through quite a many experiences most drivers never encounter. I've owned several different types of vehicles from sporty cars to not so sporty. I've driven many vehicles and have had some of the best driver training in the world. I may not be as obsessive as other guys in toying with pistons and cams, but I'm an obsessive driver. I have put nearly three thousand miles on my Volt, around five hundred of which has been in rain, snow and ice. I find that number somewhat magical with any vehicle. Five hundred miles tends to give almost any driver a good feel of a vehicle's capabilities and systems under any given circumstance. Anyone who has driven a car much knows how important friction is to a car's function on the road. Yes, friction may wear down a vehicle's parts, might destroy it's engine. But friction is an all important factor in a car's function, especially in respects to it's safety features. In many modern vehicles, manufacturers adhere to extreme standards when it comes to design. And so we return to the Volt. The safety systems on the Volt show many of General Motors' standards. The most impressive parts of the Volt's handling and capabilities in snow and ice are actually incidental. Take for example; the placement of the battery in the Volt. Very few places are a good spot for a very large traction battery and Chevy decided that the battery should be placed as low and central as possible. According to Chevy and General Motors, this placement was chosen for the ability to insulate the battery and protect it from damage during a crash. Many “pure” EVs have made a similar choice; Telsa, Mitsubishi, Via and so on. The major effect of this is that the center of gravity in the vehicle is very low. So low, in fact that vehicle is very difficult to tip over. For the Volt, such a heavy traction battery puts the center of gravity very low indeed. This makes the Volt handle extremely well in snow and keeps a good amount of tire contact with pavement in snowy conditions, even cornering. Many Volt owners do not do much driving in heavy snow, and admittedly, I myself have only driven it in a few inches at most. Though there are a scant few I have seen in the owner's forums who drive them in snow deep enough to strand other vehicles. They all report the same thing; the Volt acts like a snow plow. It's heavy weight and pointed front tends to push heavier loads to the side of the vehicle. I'm not certain I feel confident enough to try this myself, and I don't think I'd recommend it to anyone else. Speaking of weight, I've had many of my other vehicles blown around in the winter on slightly slick roads, either because they couldn't maintain traction, or simply had too large a cross section that would catch the wind. I regularly see lots of lighter vehicles blown onto shoulders and into ditches during snow storms. The Volt has little problem in wind, both due to it's weight, but also to the aerodynamics. Being that my Volt is garaged, I had no idea Denver had strong wind this morning until the end of my commute, whereupon exiting my vehicle, I found myself snowblasted in my office parking lot. But that weight has it's drawbacks, too. The Volt may handle well on snow, but I would highly recommend not using the “L” gear when attempting to slow down on ice. Being that much of a heavier vehicle, it lacks the grace of smaller cars on icy surfaces. 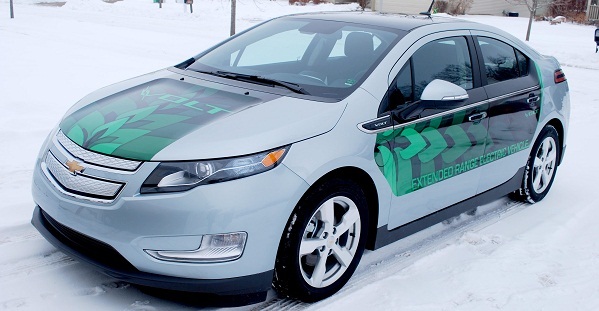 If possible, using the ABS braking is preferred, but in emergency situations, attempt to get at least two of the Volt's tires into unpacked snow (powder, for the skiers) and gently apply break pressure. This should bring the vehicle to a complete stop. As for usage of the emergency brake in maneuvers, that's completely out of the question. Since it is electronically controlled and reaction time is painfully slow, there will be no “Tokyo Drift” in the Volt. Thus, we have covered the stopping, now what about getting the car moving? Like I said before, as the Chevy Volt is considerably heavy compared to it's counterparts, it has very good traction. This doesn't mean that you can't break it free during turns and acceleration, but it does take some work. The Volt is also considerably more responsive in terms of it's power. I do not recommend attempting to race the vehicle in inclement conditions by any means. In turns, the traction control is fairly competent. Avoiding the pedal's floor position should generally keep the vehicle on the road. And as always, avoiding patches of ice that could encompass the vehicle is always wise. On a straight line incline, the Volt should climb anything even moderately slick. During our trip, we went to take a look at the holiday lights around town. We were following my parents Suburban back and decided to take a detour. It had been snowing since sunset and we did pretty well on wet and snowy roads, but our detour was interrupted by my father's text message warning caution heading up the driveway as it had become pretty slick. Their driveway is long and has a few winds, but over all, the incline is parallel to the hill. We turned down the road to the neighborhood and shortly thereafter reached the mailbox signifying my parent's driveway. The first part of the driveway is a bit slanted to the right and after scraping that wonderful wind damper under the car on the first five feet of inclined driveway, I felt the car begin to slide. I let off the pedal slightly and the Volt resumed it's grip. The first thirty feet was a little slow going, but once we leveled out, I put the pedal to the floor. The traction control kicked in and up we went. It would appear that an electric drive is much more in tune with itself than a standard internal combustion engine. The heart of the matter is the ability to completely disconnect the engine from the rest of the drivetrain, which makes traction control so impressive in the Volt. The ability of the Volt's computer to adequately assess the traction needs and adjust by what I would guess is as fine as one tenth of an amp, is somewhat mind-boggling. Upon reaching the top, even my father was impressed with “The Hippie Car” as he saw no undue spinning of the tires on our last mile. What conclusions would I draw about winter driving in the Chevy Volt? Probably pretty much the same as any other EV. Don't race it. Treat it like any other vehicle on the road. The added weight tends to offset the extra power except in slick turns and emergency braking, so definitely give a little extra follow room or at the very least, make sure there is a hard shoulder that is clear or unpacked snow. Use the traction control, despite what anyone tells you. On Electric Vehicles traction control is a completely different beast. Had I turned it off like so many people recommend, I might not be here to tell this story. Happy driving this winter to everyone! And please don't treat your Volt like a snowplow. * May I Plug in My Electric Car, Please? The Volt is supposed to engine below 25 degrees. Is that measured as battery temperature or ambient air temperature. The former makes more sense to me. Also, keeping a Volt in a garage (where it's charger is) increase its EV mode range? Thank you Matt. As US was going through severe cold and most of the South covered in snow, this story about Chevy Volt's performance in snow could help many Volt and EV owners.